Desk-and-Bookcase brings the artistry and craftsmanship of the Massachusetts-based cabinetmaker Nathan Lumbard (1777–1847) into focus. The incomparable work, upon its rediscovery, was described as “extraordinary” and is placed in context through the display of similarly designed and dated objects from the collection. 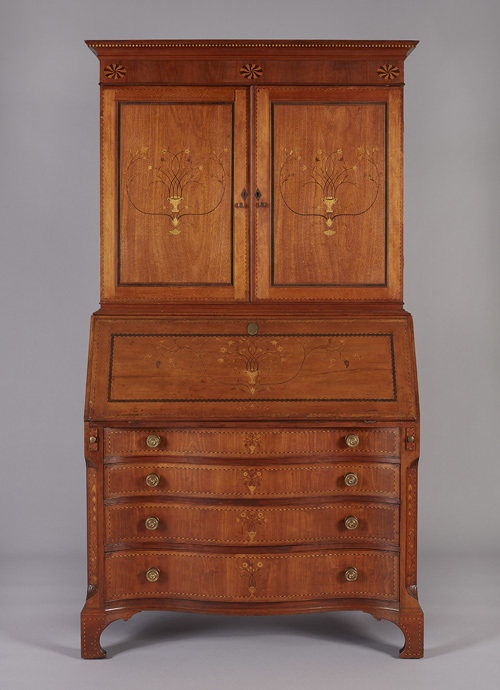 Lumbard’s cabinet has been the source of speculation since it was acquired for the Layton Art Collection, in 1996. Purchased at auction, it had puzzling inscriptions, and even whether Lumbard had made it was uncertain. Research continues to provide new information about the object. In fact, Lombard was corrected to Lumbard in the last few months—evidence of the evolving nature of museum connoisseurship and our understanding of artists and their work. Nathan Lumbard, Desk-and-Bookcase, 1800–02. Cherry, mahogany banding, light and dark wood inlay, and white pine. Layton Art Collection Inc., Purchase, Virginia Booth Vogel Acquisition Fund, L1996.1a–c. Photo by John R. Glembin.